Do NOT ever plant Raspberry vines unless you have a large field you want covered. 5-6 years ago I put a couple of Raspberry vines in the ground, Amanda loves Raspberries. They didn't do well and by summers end there was no sign of them. The next summer they came back not only where I planted them but had also moved themselves around the corner to get more sun, over under the Peach tree, into the middle of the Horseherb bed and were heading towards the back fence. Repeatedly mowing them down finally put an end of the escapees. The ones that had moved to the sunnier side of the house stayed, bloomed, set fruit and quickly became dinner for the squirrels. Even those brambles have not been doing very well lately so this afternoon I cut down and dug up all that I could get out of the ground. I sprinkled Lime on the ground to hopefully prevent any future vines, covered the area with plastic and mulch. 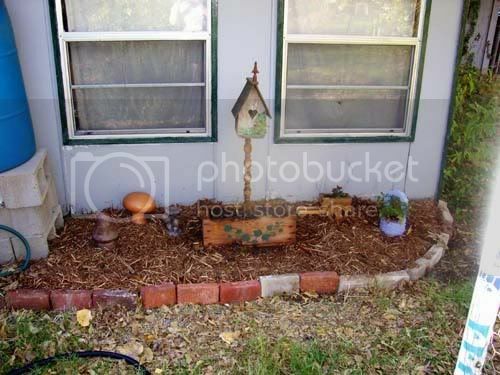 It is now the home to my growing mushroom collection, the Kalanchoe in the cart, mini-yellow rose in the purple wishing well and the birdhouse on the stick planter. I also found some Hyacinths already peeking above ground, they needed to be divided and moved so they are in the planter box under the birdhouse. I know what you mean about raspberries Toni. I certainly hope they don't regrow in your garden because the replanted area looks soooo good!! Way kewl, Toni! I hope you have successfully done away with the wayward raspberries. If Raspberries are anything like Mayberries Dewberries are Blackberries ,Good Luck.I do love the new spot where they were.Very attractive. Very nice and homey looking Toni. We have wild blackberry vines in the back where we haven't cleared yet. I know they will be a pain in the rear to get rid of.